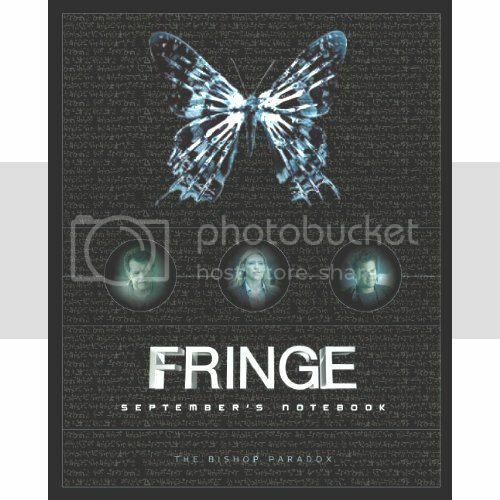 Well, the bad news is that Fringe: September's Notebook has had its release date bumped back to January 29, 2013, according to Amazon. On the other hand, Amazon has released the cover art for the much-anticipated tome and there's a very interesting subtitle on the cover: The Bishop Paradox. Now it may merely be September's way of naming all of the notes he's made pertaining to the Bishops and their particular case. But it's certainly interesting to consider just what additional meaning the phrase The Bishop Paradox may suggest. Is it something to do with Robert Bischoff? Or is it simply the paradox implied in Walter's discovery of a machine years before he actually invents it? Or... pick the FRINGE paradox of your choice. At any rate, if one assumes that TPTB would not want to release the book until the show has concluded its run, perhaps the release date suggests that the end will come sometime in January. Thanks for posting, Count Screwloose. More and more I feel like reading these considerations, the Notebook of September. The Bishop Paradox, I think it was performed or provided by the own September, when saving the frozen lake, the boy Peter. But of course it depends on your point of view that each of us looks at this question. Peter Bishop and Olivia Dunham meet when they are children . . . I still have it on pre-order and it would make sense to not release it until the show is done. Maybe the had to add a few things. Either way, I will support Fringe forever in what ever way I can.